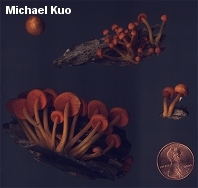 This beautiful little Mycena decomposes the deadwood of hardwoods from the Great Plains eastward. 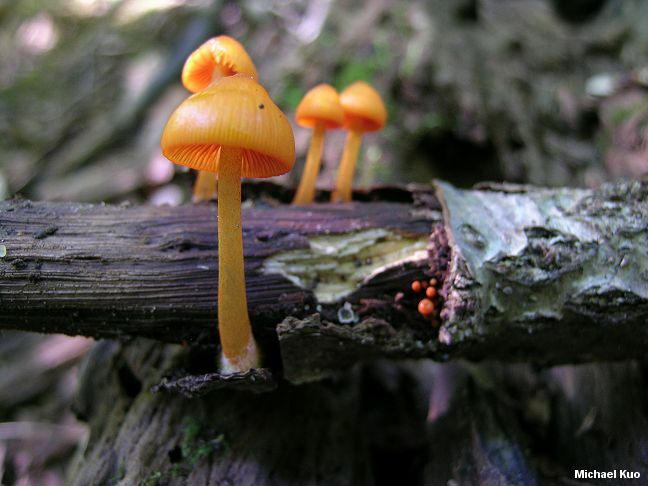 When fresh its cap is a gorgeous shade of orange, and its dull orange stem has a sticky surface. 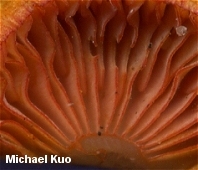 The gills of Mycena leaiana are "marginate," which is the term in Mycologese for gills whose edges are colored differently than their faces. 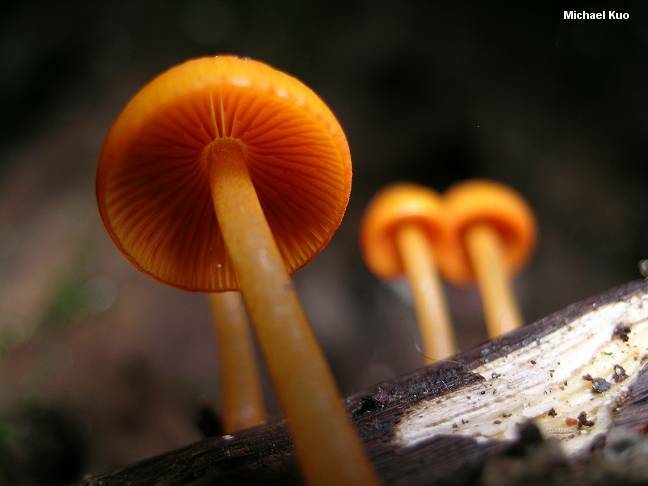 In Mycena leaiana the edges are orange, like the cap and stem, but close inspection of the faces reveals them to be creamy or very pale orange. 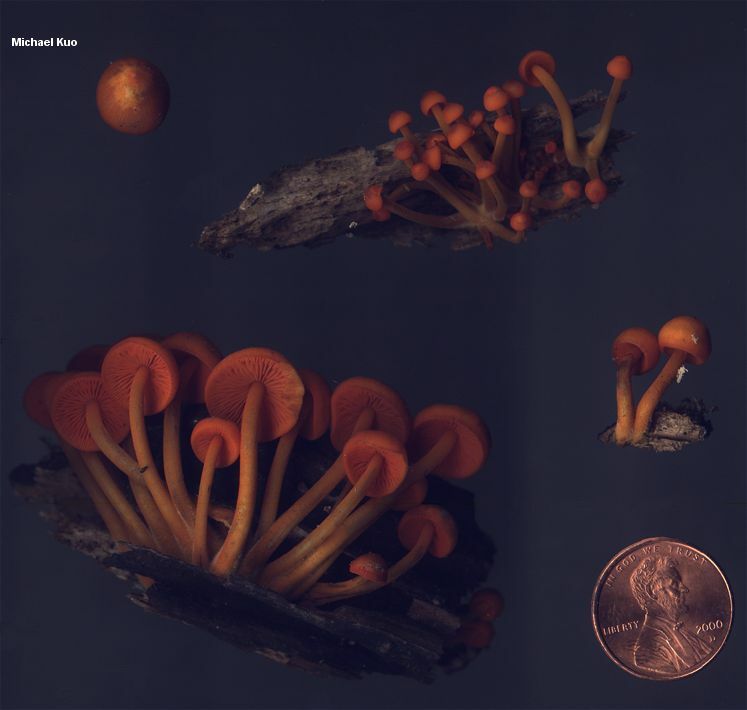 Mycena texensis, found on the wood of oaks from Texas to Florida, is similar--but its colors are generally brownish to grayish, with orangish tints, and its spores measure 4.5-6 µ long. Ecology: Saprobic on the deadwood of hardwoods; growing in tight, dense clusters (although I have on rare occasions found it growing alone, binding leaf litter under hardwoods); summer and fall; widely distributed east of the Rocky Mountains. Cap: 1-4 cm; oval or bell-shaped when young, becoming broadly bell-shaped or convex; sticky to slimy when wet; bald; bright orange, fading to dull orange and, finally, almost whitish; occasionally developing olive green stains when mature; the margin sometimes becoming lined. 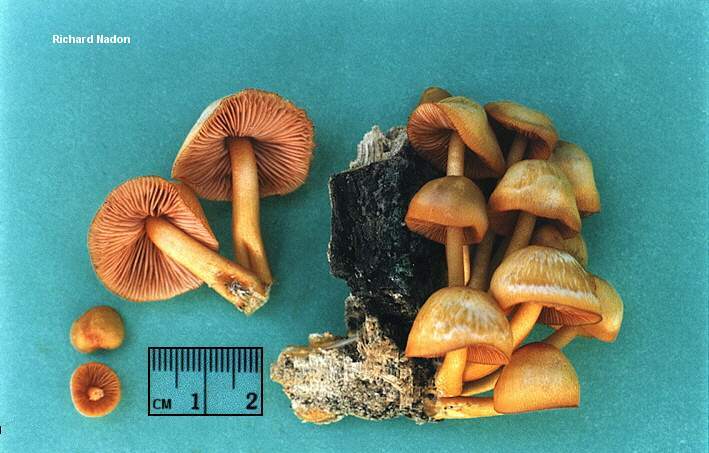 Gills: Attached to the stem; close or crowded; the edges bright orange, the faces orangish to creamy. Stem: 3-7 cm long; 2-4 mm thick; equal; hollow; smooth; fairly tough and cartilagenous; sticky when wet; the base covered with orange to whitish powder or dust; orange or orangish yellow, but paler near the apex; sometimes exuding an orange juice when squeezed. Flesh: Insubstantial; pallid or orangish. Odor and Taste: Taste mild or slightly mealy; odor mild or slightly mealy. 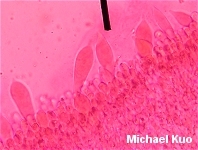 Microscopic Features: Spores 7-10 x 5-6 µ; elliptical; weakly to moderately amyloid, or sometimes nearly inamyloid when mature and separated from basidia. Cheilocystidia abundant; to about 40 x 15 µ; variable in shape, ranging from fusoid-ventricose to clavate or irregular, with one or more digitate projections. 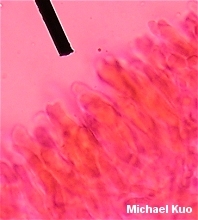 Pleurocystidia scattered to abundant; to about 50 x 15 µ; fusoid-ventricose to mucronate. Pileipellis an ixocutis. REFERENCES: (Berkeley, 1845) Saccardo, 1891. (Kauffman, 1918; Smith, 1947; Smith, Smith & Weber, 1979; Phillips, 1991/2005; Lincoff, 1992; Barron, 1999; Roody, 2003; McNeil, 2006; Miller & Miller, 2006.) Herb. Kuo 09289601, 08270203, 06150305.